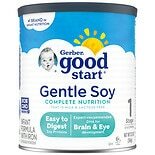 Shop Nestle Good Start Supreme DHA & ARA Soy Good Start Soy Plus Soy Based Infant Formula Powder with Iron (12.9 oz. )12.9 oz. $1479$14 and 79 cents$0.31 / oz. 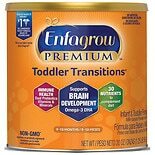 Shop Enfagrow Premium Infant & Toddler Formula Makes 141 Ounces (20 oz. )20 oz. 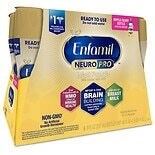 Shop Enfamil Premium Newborn Infant Formula Powder Makes 156 Ounces (22.2 oz. )22.2 oz. 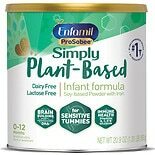 Shop Enfamil ProSobee Soy Infant Formula for Sensitive Tummy, Powder, 0-12 months (22 oz. )22 oz.